I used to cook ” stir-fries” all the time, the simplicity and quickness with this cooking method cannot be outdone in any other cuisine. When I learned to cook from Mrs Keiko Shimizu at her “Asian Flavors” classes in San Jose, CA many years ago…I learned about cooking in a small space, using one or two pots, the Wok, and another pot to cook rice…. 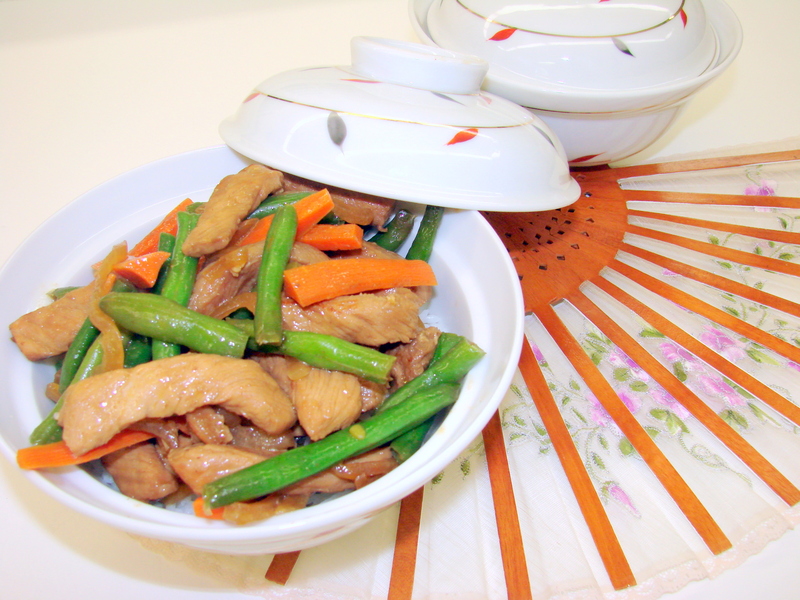 The Stir-fry method of cooking is used mainly in Oriental food preparation using a “wok.” In essence, it is a technique to cook food quickly at high heat in a large pot while stirring briskly which results in crispy at the same time tender food using very little fat. 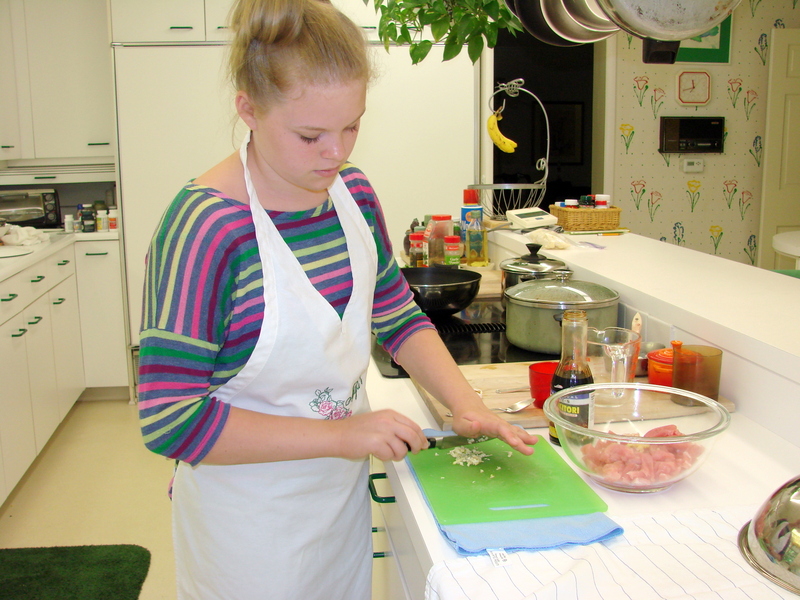 In Mrs. Shimizu’s classes it took about ten minutes to cut the vegetables and another five minutes to cut the meat in strips. Using mainly Soy Sauce and a couple of other flavors made an absolutely delicious meal in less than 30 minutes. Today with all the sauces already bottled and found in every grocery store in the Asian section it is even simpler and quicker. 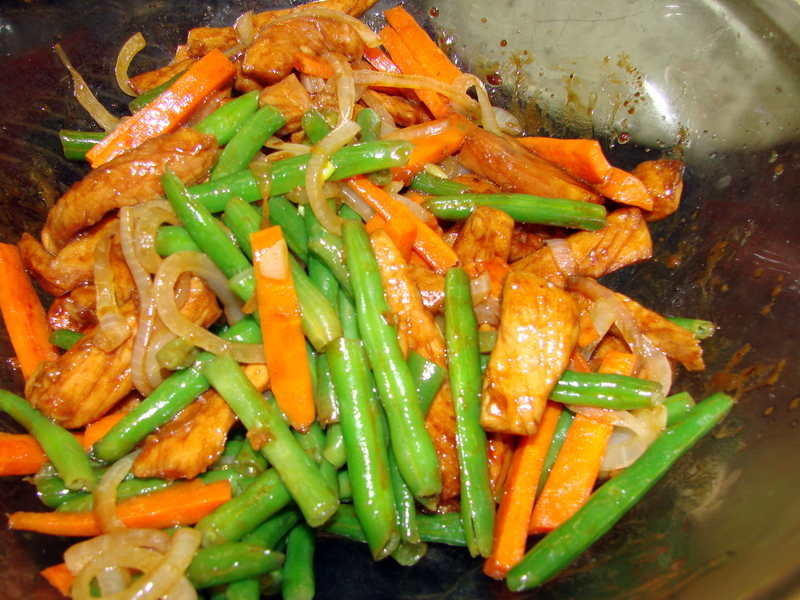 Heat a wok or skillet with a little oil and stir fry the vegetables in small portions until just done…the vegetables should not be completely cooked. Place the vegetables into a serving bowl.. 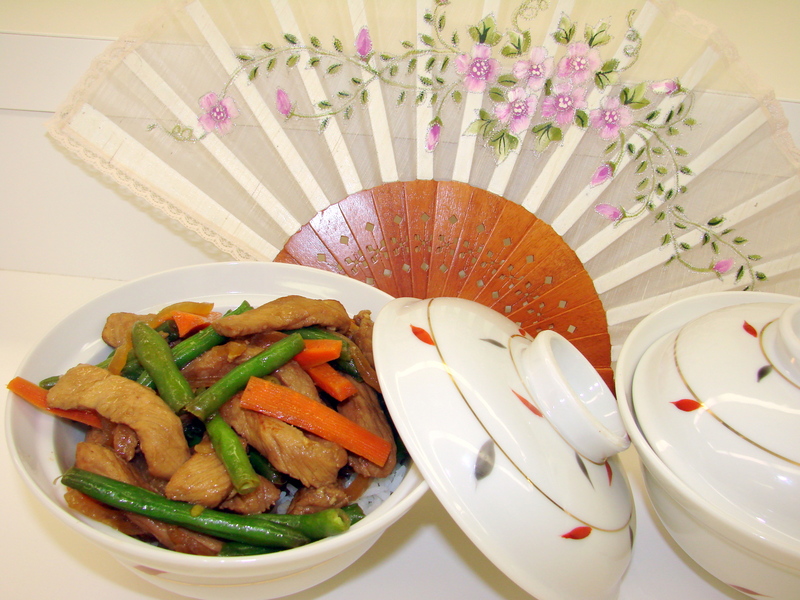 Serve the Pork Stir Fry over Jasmine Rice…or any rice! 1 cup of Jasmine Rice + 1 ½ cup of water..
Bring to a boil …and when boiling set on LOW Heat for about 5 minutes then take if off the burner and let it steam covered for about 15 minutes. Lift the lid and stir the rice…it should be dry and fluffy…. I just LOVE pork stiry fry…it’s so easy and quick and if you don’t want the rice, the meat and veggies are so filling on their own. Great dish Maria! Caterina…..Thank you for stopping bye…..and thank you for your nice comment….love to you…. This is a must try for dinner. Easy and good for a hot day. Looking forward to seeing you Friday. I printed the recipe for the Pork Stir-Fry. Patti is going to prepare it sometime this week. I will let you know what we think. I am thinking a dry Riesling will pair well. What do you think?